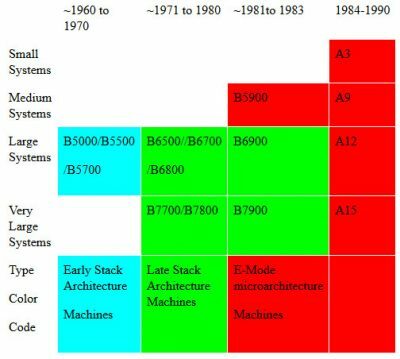 The chart shown illustrates how the Burroughs stack architecture eventually came to cover the complete spectrum of mainframe systems offered by Burroughs. The dates are approximate and there is overlap in systems not shown. In the 1960’s Burroughs small and medium systems offering were the B200/B2000/B3000 series of decimal machines. In the 1970’s the B2000/B3000 series was consolidated to the Medium market and the B1000 series of bit addressable machines was introduced for the small market. In the 1960’s Burroughs did not have a very large business computer offering. The B5000/5500//5700 Stack architecture computers made up the large system offering. Each machine had a slightly different instruction set. In the 1970’s the B6000 and later B7000 Large and Very Large stack machines were introduced. They were based on the B5000 series but had a significantly upgraded (i.e. more complex and complete) instruction set. Code for the B5000 series had to be recompiled the OS (MCP) or Compiler code rewritten to run on these machines. In the 1980’s the first E-mode machine, the B5900 was introduced. It was about 98% compatible with the B6000/B7000 series of the 70’s. In general, user programs would run unaltered, but there were some OS changes, and Compiler tweaks to take advantage of new string instructions. The B6900 and B7900 were not microcode architectures but were tweaked to be about 99% compatible with E-mode (they were between the Late Stack and E-mode architectures). The B5900 did not replace the B2000/B3000/B4000 machines in 1981 but was offered along with them. The B2000/B3000/B4000 series and later V Series were produced by Pasadena into late 1980’s and the A series finally ended that architecture and the Pasadena Plant was closed in the early 90’s. The A series was based on E-mode. The low-end machines were not only code compatible but were about 80% microcode compatible with the B5900. The A3-A5 were TTL/CMOS implementations of the B5900 and replaced the B1000 series machines in 1984. They were designed by the same engineers who used to work in Santa Barbara but who were moved to Mission Viejo and worked with my group. Because of some of the technology differences, and the fact that E-mode was now a standard and received full corporate backing, we were able to make several improvements to the microcode architecture. The A9-A15 were also microcoded, but used different technologies to achieve higher speed, including pipelining, multiple top of stack registers, virtual register reassignment, and more, but were fully E-mode compatible. These machines were all designed in Mission Viejo, CA. or Paoli PA. Mission Viejo also developed a single chip E-mode machine called the Micro-A, but it was never really marketed as a stand alone product. The A series was the end of the fully Burroughs designed hardware machines. In the late 1990’s microprocessors became very powerful and very cheap. The strategy changed to implement E-mode as an emulator on Intel microprocessors, with CMOS coprocessors to handle operations that were too slow when emulated. To get more performance, more microprocessors were added. Unisys engineers were at the forefront of multi microprocessor design architecture in the 1990’s.